This family home in Dublin features uneven blockwork walls and a terracotta-clad sloping roof, to help it match an Arts and Crafts-style neighbour. 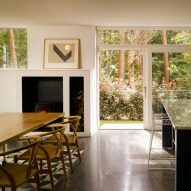 The 185-square-metre property was designed for Mark Arigho, one of the three founders of Dublin- and Belfast-based Arigho Larmour Wheeler Architects. It is built in the garden of his in-laws' house, in a patch of woodland in a south Dublin suburb. Living spaces face southeast, away from the neighbouring property and towards the woodland. 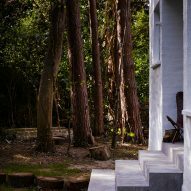 A stoop connects with the open-planned kitchen and dining area at ground level, providing a spot where occupants can take in the surrounding trees, which include mature Scots pines, sycamores and cypresses. 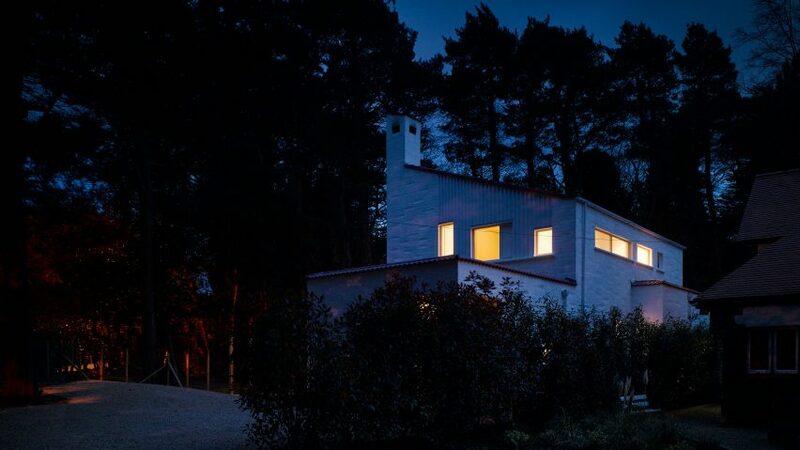 "The brief was for an intimate family home inserted gently into the woodland, respectful not only of its immediate neighbour, a handsome Arts and Crafts house, but also the wider context of the architectural conservation area, and the sylvan landscape setting in which his two young sons now enjoy scampering around helping him chop wood," said Jane Larmour, who directs the studio with Arigho and Patrick Wheeler. "The necessary proximity of the house to the mature trees called for a little bit of structural gymnastics, and so the house is raised up on piles protecting the roots, which continue under the building," she added. The blockwork walls are finished with a skim of plaster and white paint to create an uneven surface, and the mono-pitched roof covered in undulating terracotta tiles that echo those used on the Arts and Crafts property next door. "The South Dublin suburb boasts a vibrant mix of architectural styles and the local county council planning authority were clear that there was no requirement for an exercise in pastiche," said the architect. "The new house employs a material palette which is sympathetic to the character of the neighbouring houses, but it is clearly and confidently modern," it added. 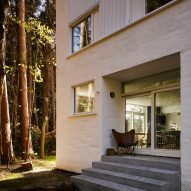 "The walls are purposefully imperfect, with white painted, lightly rendered soap-bar blocks gently knocked out in a pattern intended to soften the overall solid mass of the house." Upstairs, the materiality changes to vertical timber cladding, punctured by numerous east-facing bedrooms window that allow the residents to take in views of the treetops. Similarly, Australian studio Kennedy Nolan also recently completed a house that pays tribute to the Arts and Crafts movement – featuring sculptural chimneys and a pyramid-shaped roof.